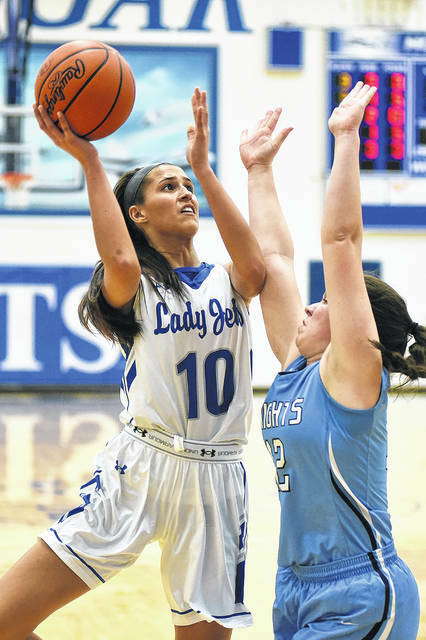 Franklin-Monroe’s Belle Cable takes a shot from near the top of the key during the Lady Jets home game with Legacy Christian on Tuesday night. The Knights handed FM its first loss of the season, 40-31. Franklin-Monroe’s Kennedy Morris goes in for a layup during the Lady Jets home game with Legacy Christian on Tuesday night. The Knights handed FM its first loss of the season, 40-31. 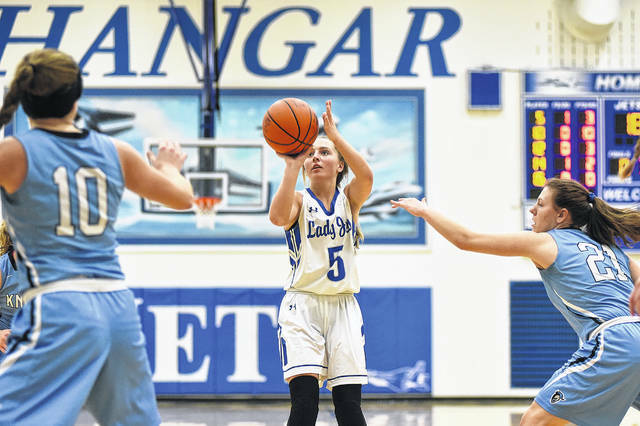 Franklin-Monroe’s Stella Shellabarger throws up a left-handed hook shot during the Lady Jets home game with Legacy Christian on Tuesday night. The Knights handed FM its first loss of the season, 40-31. 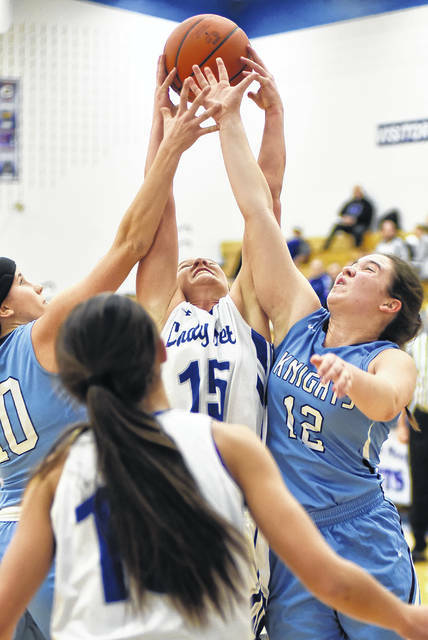 Franklin-Monroe’s Belle Cable shoots a jumper during the Lady Jets home game with Legacy Christian on Tuesday night. The Knights handed FM its first loss of the season, 40-31. Franklin-Monroe’s Chloe McGlinch shoots one from the corner during the Lady Jets home game with Legacy Christian on Tuesday night. The Knights handed FM its first loss of the season, 40-31. Franklin-Monroe’s Chloe Peters drives to the basket during the Lady Jets home game with Legacy Christian on Tuesday night. The Knights handed FM its first loss of the season, 40-31. 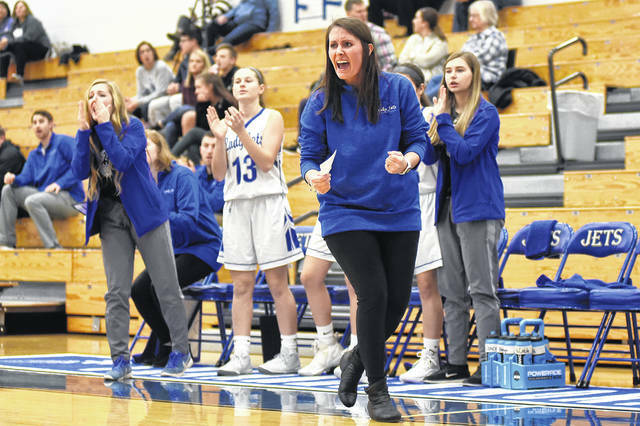 Franklin-Monroe coach Abbey Moore shouts encouragement to her players during the Lady Jets home game with Legacy Christian on Tuesday night. The Knights handed FM its first loss of the season, 40-31. 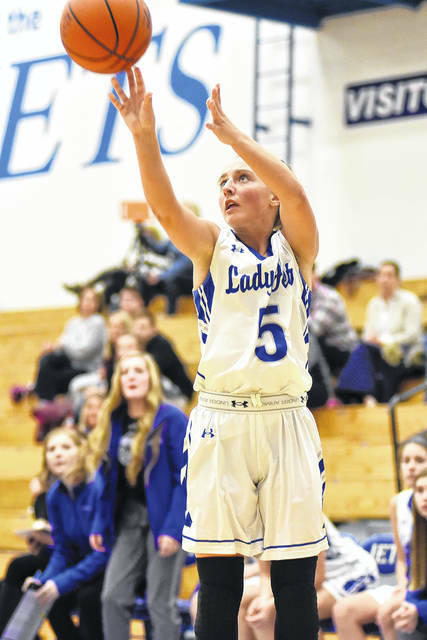 Franklin-Monroe’s Corina Conley pulls up for a jump shot during the Lady Jets home game with Legacy Christian on Tuesday night. The Knights handed FM its first loss of the season, 40-31. Franklin-Monroe’s Kennedy Morris takes a shot from underneath during the Lady Jets home game with Legacy Christian on Tuesday night. The Knights handed FM its first loss of the season, 40-31. Franklin-Monroe’s Chloe Peters goes up strong for a rebound during the Lady Jets home game with Legacy Christian on Tuesday night. The Knights handed FM its first loss of the season, 40-31. Franklin-Monroe’s Corina Conley shoots one over a defender during the Lady Jets home game with Legacy Christian on Tuesday night. The Knights handed FM its first loss of the season, 40-31. 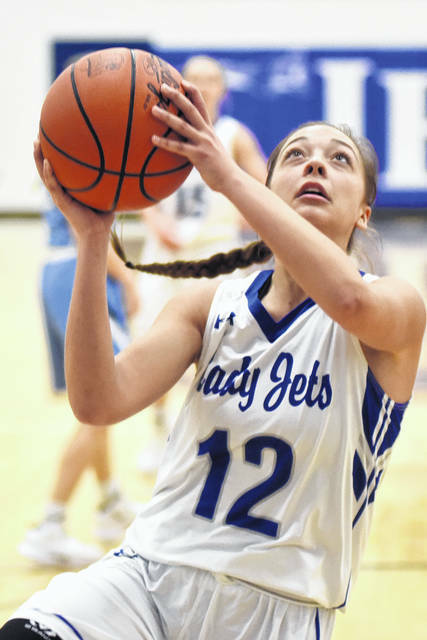 PITSBURG – It’s a big week for the Franklin-Monroe Lady Jets basketball team with back-to-back games against quality opponents on the schedule. First up was Legacy Christian, a district qualifier last year and they would be ready to play. It was a low scoring event as two very disciplined teams showed patience on offense, mostly due to the solid defense employed by each team. The two teams were evenly matched with just a mere point or two separating them throughout the first half. Franklin-Monroe held an 8-7 lead after the first quarter and then trailed 14-13 at the half. 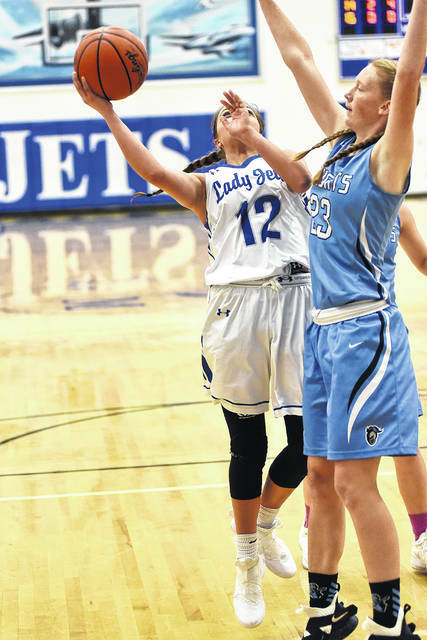 Corina Conley hit a 3-pointer and two fielders in the first half to lead the Jets with 8 points. The third quarter was even slower than the first two as the Jets struggled to get open looks from the perimeter and was unable to get the ball inside. Stella Shellabarger took advantage of the overly aggressive defense to drive into the paint for 4 points and Conley added 3 to give the Jets a slight lead 20-19 at the end of the quarter. With both teams placing so much emphasis on defense something was going to have to give going into the final stanza. Legacy Christian grabbed the lead on a triple from Emma Hess that was followed up on a second chance effort trey from Kathleen Abner to put them up 26-20 for the biggest lead of the game. 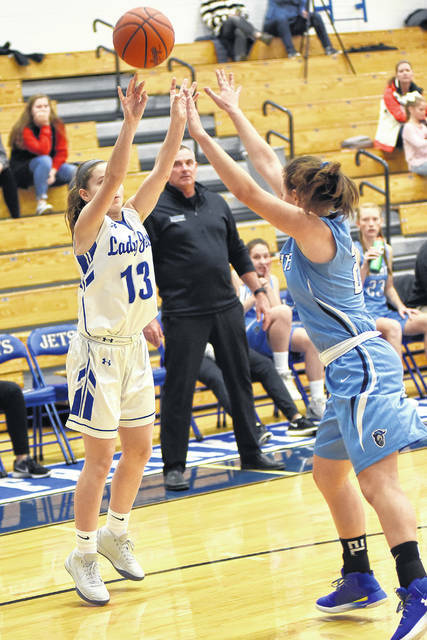 The Jet’s crawled back on two drives to the bucket, one from Belle Cable, the other Kennedy Morris narrowing the gap to 26-24 at the 6:10 mark. But Abner struck again on her fourth triple of the night and the Knights went back up 29-24 at 3:46. The Jets would end up fouling to get back in the game as precious seconds ticked away. 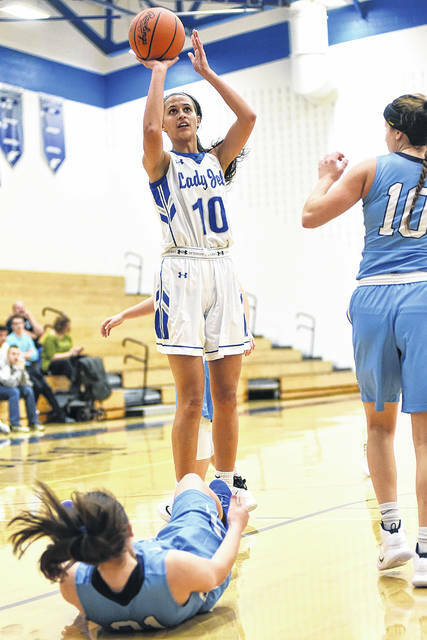 Legacy Christian held off any comeback thoughts FM had going 10-of-12 from the free throw line down the stretch to earn the 40-31 non-conference win. 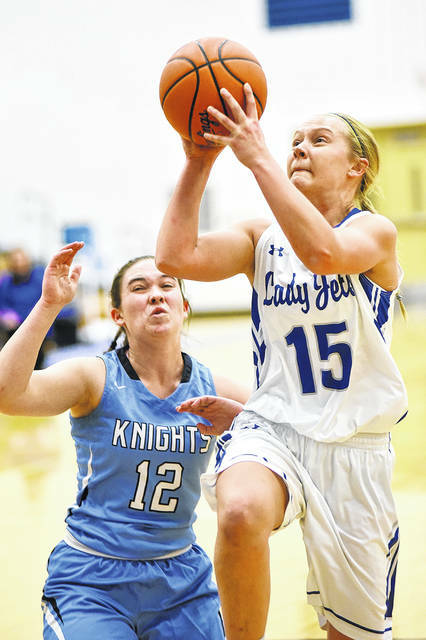 “I think both teams were a little gassed on defense which resulted in more open looks on offense and they hit a couple of big 3’s to give them momentum that we just couldn’t overcome tonight,” Franklin-Monroe coach Abbey Moore stated. “We had a conversation at the half that this game was going to come down to who wants it more and who gets the rebounds and we didn’t get that done in the fourth quarter,” Moore added. “We talked about it in the off season about improving our non-conference schedule with tougher teams like Legacy Christian and even though we came up on the short end tonight, it will definitely benefit us later when it comes to the postseason,” Moore commented. “We are right there, that was an excellent team we played and for all the adversity we have had to face already we were so close. I’m proud of my girls, but yet I expect so much of them because they have so much to prove and I know what they are capable of doing and I promise you we are going to get it out of them,” Moore concluded. The Jets were led by Conley on the night with 14 points, Morris 7, Cable 6 and Shellabarger 4. 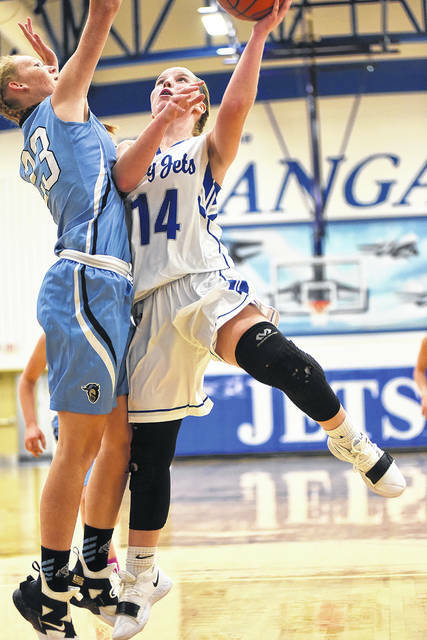 The Jet’s will quickly put this one behind them and turn their focus toward Tri-Village in a key early season Cross County Conference game at Tri-Village Thursday night.